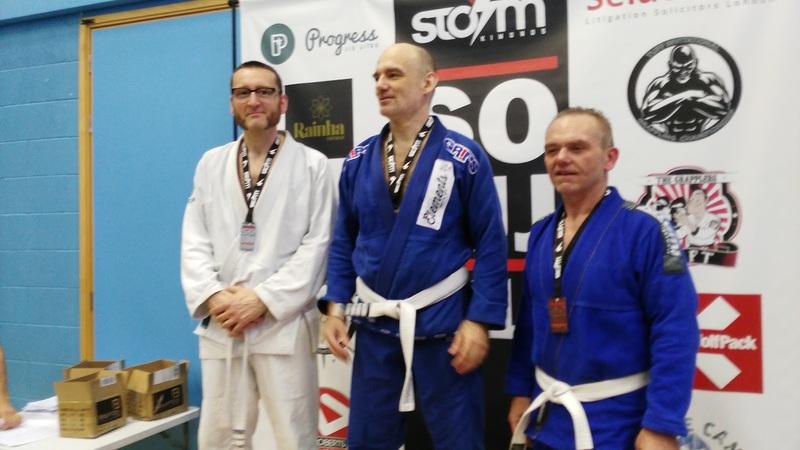 Last year, I missed the BJJ Surrey Open through injury, so I was delighted to be turning up to compete at this year's event. Even better, I was in the correct age category with two other fighters who were born before 1970. I'd put a solid couple of months of training into preparing for this and I was about as injury-free as I get these days. I'd also been really careful about making weight in the months leading up to the event, so I didn't have to lose excessive amounts in the weeks before it, and I made 181 lbs with something to spare. My key goal at this event was to not make stupid mistakes and try to attack more, and I think I did that. In the first fight, I pulled guard from the off and threatened chokes from there, then got mount, tried an Ezekiel choke, spun into an armbar, got back to mount and finished with an Ezekiel choke. Although a decade older than me, my opponent was stupidly strong and was a karate fighter with 30 years experience. But I got into a dominant position and I didn't relinquish it. In the second fight, I tried to pull guard and managed half guard. I threatened a loop choke at one point, but it was very much a game of me not managing to establish full guard or launch any meaningful offence from half, while he moved into better positions, which meant I was playing positional escape and trying to re-guard. I didn't get submitted, but he beat me by a lot of points. His frame and movement was very good and he was better than I was. Overall, though, I was pretty pleased with today. I'm never going to be a really aggressive or exceptional grappler, but I can be a solid one and today I felt OK to be competing again. It was also good to meet two more grapplers in the olds category. On the mats, I'll have better days than this and I'll have worse days than this. The trick is to just keep having days and to keep learning. I think that's the right attitude.